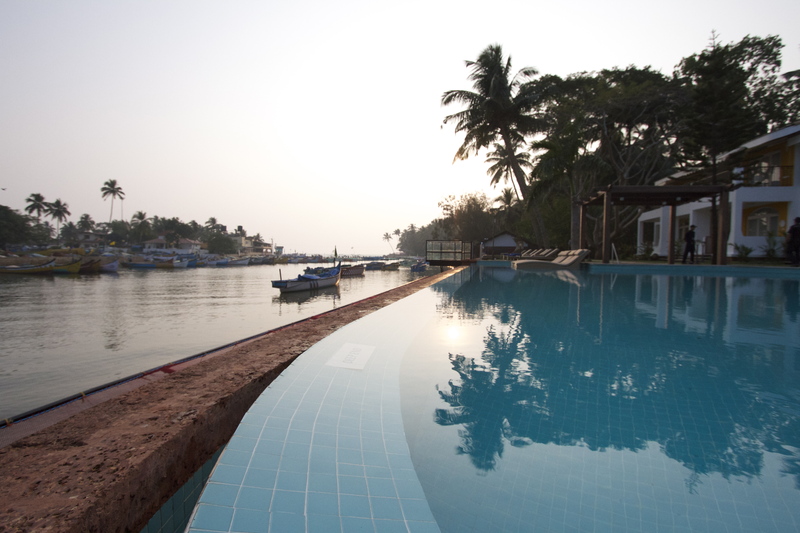 The Acron Waterfront Resort was launched in Goa this month with a gala charity dinner. Overlooking a calm estuary, the resort has a relaxing southern French vibe to it, especially because of the minimalistic architecture, running row house format and sunny beach shades of yellow and blue. Other than the regular resort features of a spa, pools and Jacuzzis, this niche property at Baga (it has just 29 rooms) provides personal butlers for every guest and every room boasts of a sea view. But, what will make AWR the new hotspot for tourists and the country’s elite is the culinary experience it promises. Celebrity chef Cyrus Todiwala will be the Master Chef at Acron Waterfront Resort (AWR). The launch party was a luxurious affair. Five esteemed chefs had set up tables, serving their personal bests to the guests. I started with an interesting dish chef John Feeney had created – A red onion and paneer doughnut (more like a fried dumpling) drizzled with brown sugar, cauliflower couscous salad and pickled onions, served with baba ganoush and bacon jam. After the quick snack, I moved to chef Cyrus Todiwala’s table. The starters were an array of Indian recipes served contemporary style. Pretty akoori tartlets, a spicy beetroot rasam, Parsi balchao-style prawn patia chappati and Goan rice dumplings filled with spiced cheese. Chef Paul Cunningham was a favourite with the Indian crowd with his henne style samosas, mutton keema rolls, honey-mustard kingfish and a summery crispy shrimp and green mango salad. Chef Shubham Dhar had fantastic main course offerings, both continental and Indian. His roasted vegetable lasagna in pesto sauce and chicken breasts with lemon and sage were one of the highlights of the evening. He also served a succulent Awadhi baby lamb curry and a Moroccan tagine filled with winter vegetables, chickpeas and basil and prunes for a modern twist. All his dishes were a beautiful balance of robust flavours and wholesome goodness, perfect for a chilly winter evening by the river side. Chef Todiwala had rustled up a variety of Parsi favourites like patra ni machhi, jardaloo ma murghi, leeli tarkari and vaaghaerala chawal, but his Country Captain, a slow cooked mutton shoulder casserole of sorts with a tomato-based sauce and chilli potato mash was definitely the star of the evening. My personal favorite though was chef Colin Bussey’s citrus barley risotto with a whisky and brown butter and generous chunks of home-cured and lightly smoked kingfish. 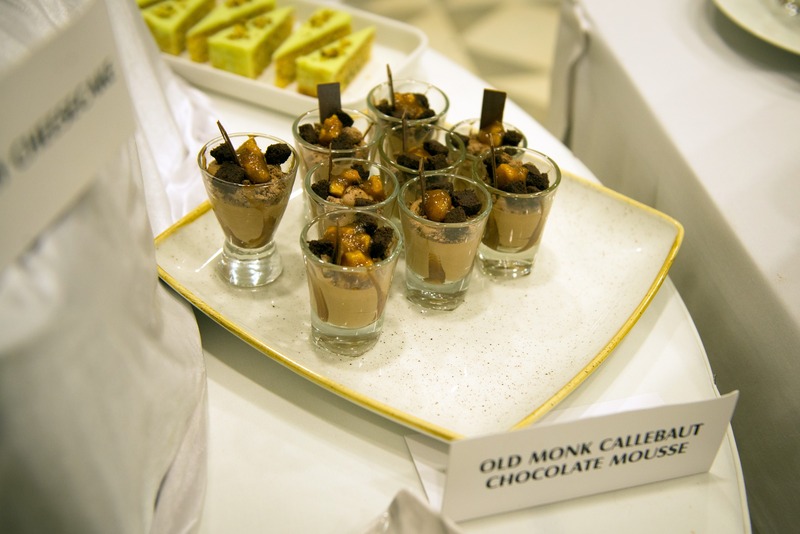 Desserts were with chocolate wizard chef Sarah Hartnett – Old Monk Callebaut chocolate mousse with a banana cardamom caramel jam (yes, it was as ethereal as it sounds. I have no count of how many servings I had of that rich creamy delight), a fruity and smooth pistachio and lime polenta cake, strawberry cheesecake with a roasted cashew crumble (a wonderful relief from the usual crushed cookie crumble base) and a startling finish – coconut cream and malt crumble with pineapples soaked in feni – which was a befitting toast to Goa and all the wonders it has to offer.